1. This is the only New Testament book which we don’t know the author of. There have many attempts to deduce the author of this book, yet nothing definitive. Paul, Barnabas, Silas, Peter, Apollos, and others have been proposed. The early church fathers didn’t know who wrote this book and at the end of the day we have to admit as well that we just don’t know. In reality, it doesn’t matter so much because the Holy Spirit is the ultimate author. 2 Peter 1:21. 3. The chief underlying theme is the superiority and pre-eminence of Christ. It is rather fitting that the author is anonymous because the book is all about how Christ is above everything else and everyone else in glory and power. While there are many deep doctrines in the book recognizing Christ’s supreme position is of vital importance. It also will have a deep impact on our lives if we live our life with Christ on His throne and submit our will to Him. 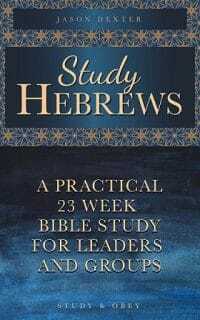 Who is the author of Hebrews? Why do you think he chose to remain anonymous? Who was it written to? Why would God choose to speak to people differently in different ways? In what different ways has God chosen to communicate to people? How does God primarily speak to us today? What are the benefits of this method? What should we do knowing that God communicates to us in this way? What does it mean that Christ is the radiance of His glory and the exact representation of His nature? What does it mean that He upholds all things? What impact should it have on our lives knowing that Jesus actually upholds everything by His power? Where is He now and what is He doing there? What does it mean that He has “become” better than the angels? Was He ever ranked lower than the angels? 2 Peter 1:21 – The Holy Spirit is the author of Scripture no matter who wrote it. 1 Peter 1:10-12 – God’s revelation is progressive. 1 Peter 1:20, 1 Corinthians 10:11 – These are the last days. John 1:3 – Jesus is the Creator. Colossians 1:15-20 – The pre-eminence of Christ. 1 Peter 3:22, Romans 8:34 – Christ is at the right hand of God. 1. The author starts right in on his main point that will be repeated over and over throughotu the book, the superiority of Christ. In this chapter we will see several ways that Christ is superior and exalt Him for this. 2. God has spoken in many times and in many ways. In the Old Testament He primarily spoke through prophets. Christ is supreme because these prophets were sent by God to prepare the way for Christ. John the Baptist, as the last of the Old Testament era prophets, came to prepare the way for the Messiah. All the others did as well. They prepared the way by showing people their lost state and need for help from God. They prepared the way by showing that people can’t get to God by their own efforst. And they prepared the way with prophecies (hundreds of them) about the future Messiah. This is really the key of the entire Old Testament. The OT shows us God’s grace and man’s sin. It shows us that we have no hope on our own and need God to send a Savior to us. While Jesus’ name is only mentionedi n the New Testament, to truly understand His supremacy we need to recognize that the entire OT is preparing people for Christ’s coming as the culmination of God’s plan for the world. 3. God has spoken in many ways. This includes visions, dreams, angelic messengers, “out of body” experiences, prophets, Scripture (by way of inspired human authors) and His Son, Jesus. God created people with a spirit and a need to have a relationship to Him. By nature, we are spiritual. People seek to fill this void by trying to understand the supernatural aspect of the universe. The problem is that since we are the created beings we cannot by ourselves understand who God is, what His character is like, or His plan for the world and for our own lives. Philosophers sit around their tables or under a willow tree or under the stars but can only speculate upon these issues. Every now and then a person will come along who seeks to bridge this gap and understand the supernatural by creating a new religion. But this is only his guess or his own system for understanding the world. The problem is that a created being can never understand the infinite Creator unless the Creator reveals Himself to the creation. The good news is that God has done exactly that. He didn’t create the world and then leave and allow us to fend for ourselves and guess about the meaning of life. He HAS revealed Himself to us. This is not surprising since most parents want to educate their children. God wants to educate us as well. It is an amazing privilege and blessing that God has condescended to reveal Himself to us. What application should we get from this? We must do everything our power to learn this revelation (by studying the Word) and obey it. 4. These last days – See cross-references. We are in the last days of the world. God’s revelation and plan is progressive and we are in the last phases of it. This too is a great blessing for us since we can understand the whole picture much more clearly than the people who came before. For whatever reason God did not choose to reveal His entire plan all at once. He chose to do it step by step. Everything He revealed was 100% true, but it was not 100% complete. He has progressed from promise to fullfillment. But even now, not everything is fulfilled and not everything is understood. Sometimes we will come upon a difficult question for which there seems to be no answer (like the Star the wise men followed) and just file it away content to understand when we can ask Christ face to face. For our own lives too, God does not always reveal to us what we should do long ahead of time. It is enough to know the next step. His Word is a lamp to our feet and a light to our path. He tells us what we need to know when we need to it. 5. He has spoken to us through His Son. Jesus is the very mouthpiece of God. Even as a 12 year old boy in the temple He was able to answer the tough questions of Scripture that no one else could understand. I saw a movie where a young man was doing business with a partner for his family. The partner wanted to talk to his parents to make the deal. The man said, “I speak for my family.” Jesus speaks for the Father. He is His representative. Jesus not only spoke the words of God, He lived as God. He showed us a perfect example of how to respond in numerous situations. His actions were 100% perfect and wise every time. The common phrase “WWJD” is a good one. When we face a problem and we don’t know what to do just ask “what would Jesus do” and then do that. Many times we can know what He would do because He already did it. Jesus is the Greatest Messenger. a) He is the heir of all things. b) He made the world. John 1:3.
c) He is the radiance of His glory. d) He is the exact representation of His nature. e) He upholds all things by the word of His power. f) He made purification for sins. g) He sat down at the right hand of God. h) He is better than the angels. What is the main point or points of verses 5-14? Why do you think the author spends so much time showing that Jesus is superior than the angels? What proofs does the author use to show that Jesus is indeed superior to the angels? What was Jesus’ attitude toward sin? How about yours? How does the Old Testament testify of Christ’s deity? What should our attitude be toward Christ? How should our actions and lives change if we truly recognize and live by the fact that Jesus is Supreme and over all things? Psalms 2:7 – You are My Son, today I have begotten you. 2 Samuel 7:14 – I will be a Father to him and he will be a son to me. Psalm 97:7 – All so called gods will have to worship Christ. Psalm 45:6-7 – Quoted in Hebrews 1:8-9. Isaiah 61:3 – Oil of gladness. 2 Peter 3:10-12 – The world will one day be destroyed. Hebrews 13:8 – He is the same yesterday, today and forever. 1. The author approaches his “thesis” on Christ’s supremacy in a very systematic way. Basically he uses proofs to show that Christ is superior to many things that people would have a very high opinion of. If Christ is superior to all these things, then He is indeed pre-eminent. An example would be a person who believes that a certain teacher is the best teacher of all time. To prove this he takes all of the widely accepted top teachers and proves that his candidate is better than each of these individually. If he can prove this, then it is logical that that teacher is indeed the best teacher of all time. 2. The writer starts off with proving that Jesus is superior to angels. Westeran culture now has a certain infatuation with angels. There are movies and books about angels. Many people collect angel figurines. People are just fascinated with the concept of guardian angels. In history at various times people have paid a lot of attention to angels. Angels are very amazing. In the Bible we see that angels have great power. One angel killed 185,000 trained soldiers in one night. Another time an angel killed every firstborn child in Egypt. Angels are fearsome. Most of the time when an angel appears the person he appears to is frightened and even falls down to worship the angel (because the angel is supernatural). Angels can appear and then disappear. They can even appear as ordinary people (Hebrews 13:2). They fight God’s battles. They are in the very throne room of God. I fully believe they are stil very active in this world fufilling God’s plans, protecting His people, fighting off demons, being used by God to answer prayer, etc. We should not get pre-occupied with angels (Satan did this already and exalted himself instead of God). They themselves always said do not worship them. Yet it is only recognizing a fact to see that they are one of the most amazing parts of all of God’s creation. If Jesus is greater than the most powerful thing IN creation, than it would stand to reason that He can only be the Supreme Creator. 3. Verse 5 – See Psalms 2:7 – Jesus has a special relationship with God as His one and only Son. The angels were created by God, but they do not have a Father/Son relationship with God. 4. Verse 6 – The angels of God are to worship the Messiah so God puts them under the Messiah. 5. Verse 7 – See Psalm 104:4 – Angels indeed have a high and important position, but the characteristics ascribed to them are nothing like the characteristics ascribed to the Messiah. 6. Verses 8-9 – Psalm 45:6-7 – Christ is the King. He is on the throne. His dominion is forever and ever. He loves righteousness and hates sin. We should follow Christ’s example to hate sin as He does. 7. Verses 10-12 – Christ created the world. This fact is affirmed many times in Scripture. This shows His supreme position. It is a naturally evident fact. When you look at the world you can see how amazing it is. It has must have a designer who is infinite in wisdom and power. Yet Christ did not only create the world. One day He is going to destroy the world. This world will not last forever. One day there will be a new heaven and a new earth. 2 Peter 3:10-12, Revelation 21:1. Yet although everything we see around us will not exist anymore, Christ will still exist forever completely unchanged. Before this world was here, He already existed forever. After this world is gone, He will continue to exist unchanged forever. 8. Verse 13 – He sits at God’s right hand. This shows that He has the very top position. No angel sits at God’s right hand. 9. Verse 14 shows us what angels are doing. They are ministering spirits. They are sent out to serve us who receive salvation. This shows us too how much God loves us that He even sends out angels to minister to and serve us. We should not focus on the angels, but we should give glory to God for His kindness and compassion in using angels to help us. 10. Application: Ask and discuss potential applications for this chapter. How does it impact you that Christ is supreme? Is there anything you need to obey from what you have learned? Is there anything you need to change or start doing so that Christ will be the priority in your life as He deserves?